My first visit to the SOI was in 2013, and I was very surprised by the quality of the ensemble. I had a very nice experience on this trip, and enjoyed the company of the people in Mumbai—Khushroo Suntook, the musicians, and the staff. So, in 2015, I returned with pleasure and found an even better orchestra, which had greatly improved in the two years. I look forward to performing with the SOI again. It is wonderful to see the birth of an orchestra of this level in India, to see it grow and develop; to discover, concert after concert, its superb potential; and it is a great personal and musical pleasure to participate in this beautiful adventure. Your orchestra and its administrative staff are some of the warmest colleagues with whom one could hope to perform great music. I look forward to returning many times to the Symphony Orchestra of India to celebrate the great masters of the classical canon. I've performed with many symphonies: Vienna Philharmonic, Berlin Philharmonic, Munich Philharmonic, San Francisco Symphony, Los Angeles Philharmonic, London Philharmonic Orchestra and many others. The Symphony Orchestra of India is truly one of the best and most musical orchestras that I've had the pleasure of working with, and for that I am incredibly grateful. I consider myself fortunate to have been commissioned for the writing of Peshkar and performing it with the SOI has been a delightful experience. Looking forward to our future collaborations. I was honoured and very excited to be invited to play with your wonderful Symphony Orchestra of India a couple of years ago. The experience was very fulfilling indeed - the quality of the musicians, the administration and the atmosphere of the concert. I was also overwhelmed by the response of the audience. It was a complete pleasure. It was amazing to make music together. I think India is now more complete with your orchestra and I want to salute and thank each of the orchestra members and staff! You have accomplished so much. You have given so many wonderful performances to your audiences. You have travelled and toured far away from home. You have brought many great artists to Mumbai. You have begun the great task of education, not only of your audiences, but also of your youth; the musicians, performers and patrons of tomorrow. And most importantly you have lit an ever-lasting and ever-growing fire, desire and hunger for classical music with the generations to come. My concert with the SOI was a wonderful, very special and memorable experience for me. The level of the orchestra was really great. Together with my wonderful teacher and mentor Christoph Poppen as the conductor of the concert, the experience was simply perfect. The vibrant atmosphere of the city was matched by the commitment and enthusiasm of the players of the orchestra, who, despite their different backgrounds, worked wonderfully together as a whole. I had the privilege of playing under the baton of Zane Dalal, who, knowing the orchestra so well, can coax out the nuances of phrasing and colour to such beautiful effect. There was a great sense of making music together, just like in the chamber repertoire, where listening always has priority over watching. For me the foundation of the Symphony Orchestra of India has been one of the most unbelievable cultural projects in the last decades. Travelling a lot as a guest conductor I know how many aspects count for making a symphony orchestra work successfully, and the success of the SOI is truly phenomenal! It makes me feel extremely happy and proud that I've been privileged to share my musical experience with their wonderful musicians. It is with great pleasure that I am looking back to the exciting weeks which I have spent with NCPA. The orchestra and everybody who is standing behind it have my full admiration. It is amazing to see what you have built up during the last ten years and I am absolutely sure that the NCPA and SOI will have a great future. There is nothing more beautiful for a musician than the feeling to reach the hearts of both the musicians working with him and of the audience – I will always remember the warm welcome I have been offered by the Symphony Orchestra of India, their officials and their audience. I experienced some of those moments of happiness and joy there which you only feel when you can share your feelings for music with those who listen to you! 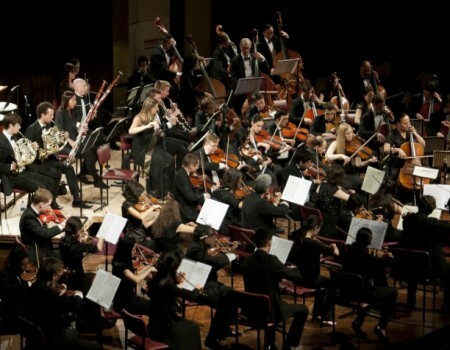 The rise of the Symphony Orchestra of India has been nothing short of phenomenal! What they have already achieved in ten short years is surely beyond even their expectations. I was completely taken by the enthusiasm and the warmth of both the musicians and all the organizers involved. This orchestra is going from strength to strength. I’m looking forward to many more years for the orchestra to have most exciting collaborations with the world’s best artists bringing the most beautiful music to India. It was a great experience to play the Beethoven Triple Concerto with the SOI some years ago! I loved the atmosphere and excitement in the orchestra and public alike! Music clearly means a great deal to all taking part. I remember very well my first meeting with the SOI when already at the first rehearsal I knew that this is an ensemble where I felt very much at ease, because the musicians had heart and soul which is the most important to understand art and music. I had a wonderful experience working with the SOI on my first visit, preparing them for the Verdi Requiem and conducting the opening concert with Marat as the soloist. I then came on board as the Resident Conductor just a few months later. I’ve had the honour of working with the great team of the SOI and I can hear the progress we have made when I compare our first concerts in 2015 and the ones we perform now. I am proud to be a part of this ambitious project, and I look forward to making more beautiful music with the SOI.